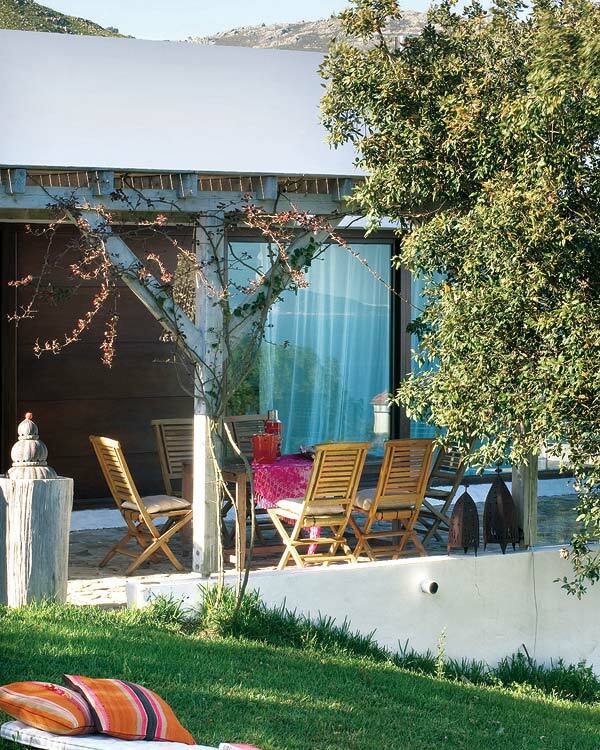 This wonderful summer home is located on the southern coast of Spain, in Tarifa. 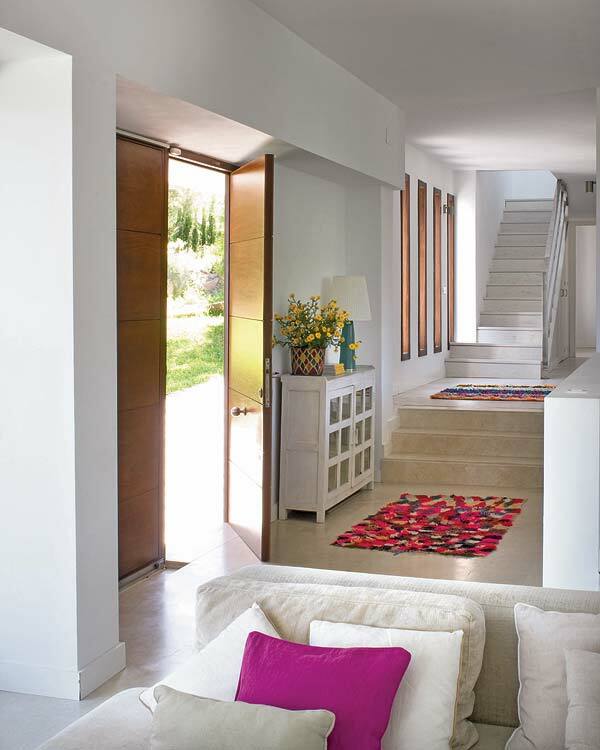 The entrance way, has a beautiful warm wooden door, neutral stone floors, off-white furniture, and brightly colored area rugs. The living room is composed of neutral sofas and ottomans. It has a modern white fireplace, with a black screen. A rectangular mirror and two vases are placed on the mantle. 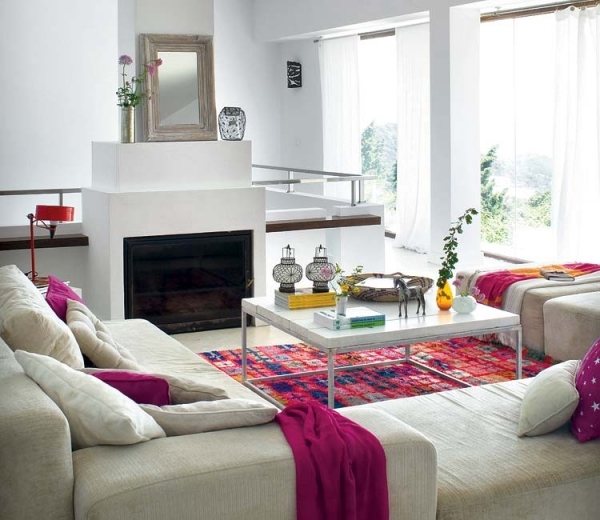 In front of the fireplace, there is a white table sitting on a bright multi-colored rug. The floor to ceiling windows are covered by long, sheer, white curtains. 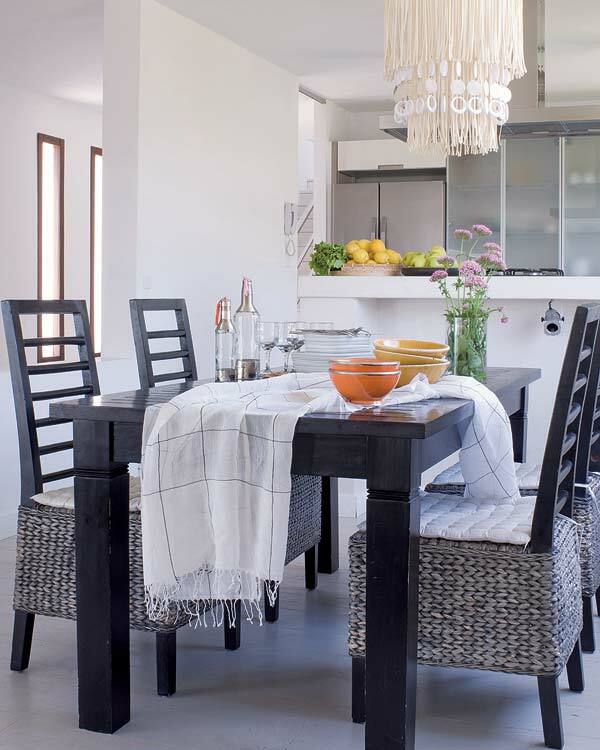 Stepping up to the dining area, this fantastic summer home, has a black wooden table, surrounded by detailed contemporary chairs. A large square window provides natural sunlight to the space. A creme chandelier with tassels and small circular shapes, hangs over the well-designed eating area. 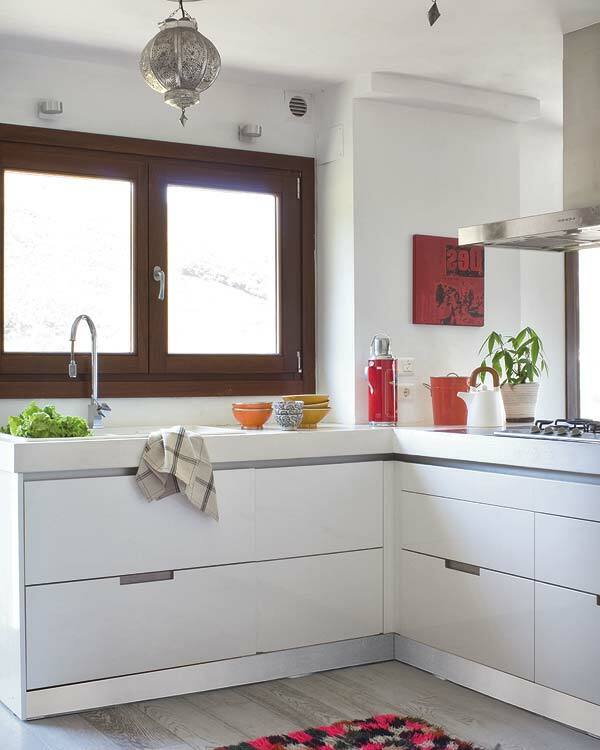 This kitchen has a fantastic window over the sink and light wood flooring. It also has white modern drawers and translucent cabinetry. The master bedroom is delightful and spacious in this summer home. It has a lovely caramel colored, platform bed. 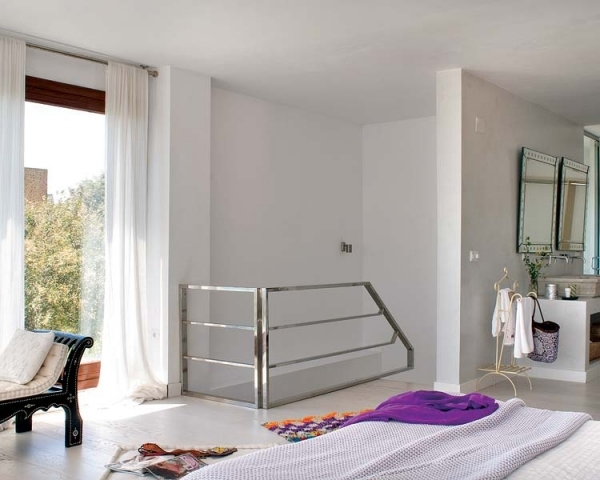 Above the bed, there is a large brown abstract artwork, and beside the bed, a white table. On the light hardwoods, there are two large white floor pillows. Floor to ceiling windows continue in this room, along with the airy, white sheer curtains. A unique black and creme chaise lounge, sits across from the bed. The bedroom organically flows into the bathroom, only separated by a free-standing dresser. 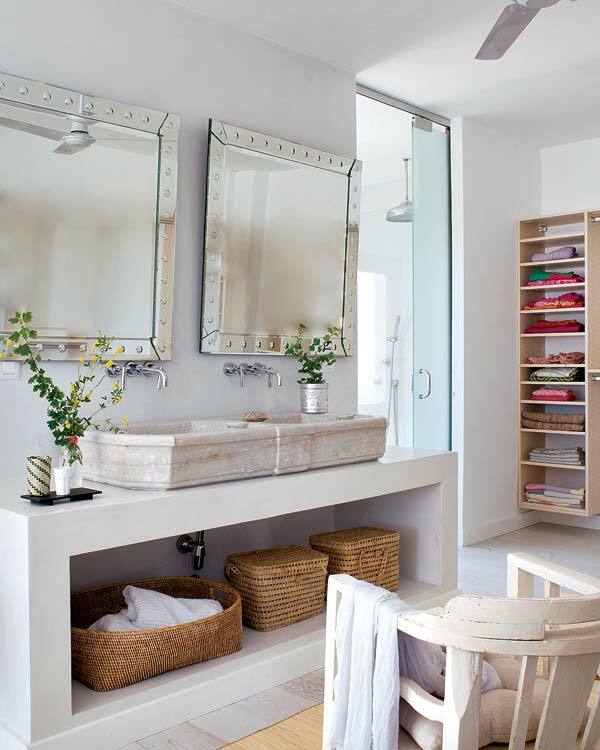 The bathroom has gorgeous gray stone sinks, and instead of cabinets, it has an open storage area with wicker baskets. Silver fixtures and a wonderfully worn creme chair, complete the front of the bathroom. Further back, there are shelves for clothing, and a large shower with a translucent glass door. Modern and unfussy summer home with beautiful and unique details.